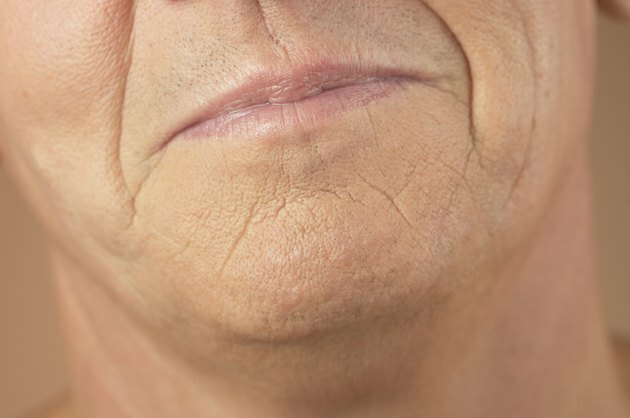 Cigarette smoking causes premature aging and symptoms such as wrinkles and lines. According to the Mayo Clinic, nicotine in cigarettes narrow blood vessels in the outer layers of skin and reduce blood flow to these areas. As a result, your skin is deprived of the oxygen and nutrients it needs to stay healthy and youthful. While fine lines above the lips and elsewhere on your face are the most visible, smoking also causes wrinkles elsewhere such as your inner arms, states the Mayo Clinic. Removing or reducing wrinkles can be challenging, but you have a few options at your disposal. Stop smoking. It's counterproductive to attempt to treat wrinkles if you continue the habit that's causing them. As the Mayo Clinic points out, cigarettes also contain other toxic chemicals that break down collagen and elastin and cause wrinkles. Plus, being exposed to heat from cigarettes and making repeated facial expressions while smoking also increase wrinkles and lines. Get advice from your doctor about quitting cold turkey or nicotine replacement therapies. Wash your face and body with mild, moisturizing soaps or liquid cleansers to limit dryness, which makes skin more likely to wrinkle. Moisturize your skin while it's still damp with a coenzyme Q10 cream or gel. According to Hirsh Dermatology in Ohio, this antioxidant protects skin from substances that break down collagen. Or, apply a vitamin E cream, which reduces the depths of wrinkles. Also, alpha hydroxy acid skin products boost collagen and elastin content in the skin to reduce wrinkles. Eat foods rich in vitamin C such as oranges, grapefruits, papayas and red bell peppers, or take a daily vitamin C supplement. This nutrient is a key building block of collagen and is also a potent antioxidant that helps protect the skin from wrinkling. Apply a broad spectrum sunscreen at least 20 minutes before you go outdoors. Sun exposure is the leading cause of wrinkles, according to the American Academy of Dermatology. It damages collagen and impairs collagen synthesis, making any damage your skin has suffered from smoking even worse. When home remedies don’t give you the results you want, you might consider cosmetic procedures. Some of these treatments, such as hyaluronic acid injections and laser resurfacing, trigger collagen production and prevent it from breaking down. Speak to your doctor for advice on the maximum amount of vitamin C you should take. The amount can vary based on your gender and whether you have any medical problems. Also, higher doses can cause side effects such as diarrhea and nausea and interfere with blood test results, according to the Merck Manual's Online Library. Mayo Clinic: Smoking: Does it Cause Wrinkles?